20 Litres JUST $114 INC GST !! 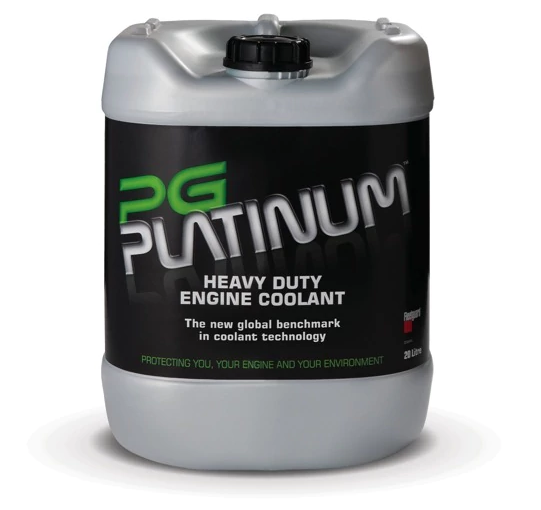 PG Platinum is Cummins Filtrations flagship product for the engine coolant range. It is also sold and marketed under the Cummins Tec Infinity brand – yes, it’s the same extended life coolant! PG Platinum meets Cummins stringent CES 14603 and ASTM D6210 standards. Order at https://shopping.torquepower.com.au/#ShowAPart&CC36084 or call 0732778277 FREE Local ( 10kms) delivery. 170 Beatty Road, Archerfield. 2-Ethylhexanoic (2-EH) acid free formulation compatible with all gaskets, elastomers and other non-metallic in the engine, such as silicon seals and hoses. Improved environmental (NAPS free) formulation meets global OEM specifications for containing no Nitrites, Amines, Phosphates, Borates, or Silicates. At 500,000 kilometres (6,000 hours) intervals, use the PG Platinum™ 4-way Test Kit to check coolant quality in the field and refortify your coolant as needed with PG Platinum™ Extender. With proper system maintenance PG Platinum™ is a 1.5 million kilometre (20,000 hour) lifetime product. Protect your Engine Against Wear Coolant filtration is proven to reduce wear and optimise cooling system performance. This is especially important for coolants that stay in the engine longer. The chemical additives in the coolant are outside acceptable limits – typically caused by incorrect top up practices or by failing to do maintenance at the recommended service interval. The pH is outside acceptable limits – typically caused by combustion gases entering the cooling system, which can damage cooling system components. Contaminants in coolant exceed published condemnation limits – which is only likely in unusual circumstances. We can help determine if the coolant in your engine meets these limits.